The Middle East will this year increase capacity to process crude by 530,000 barrels a day, or 6.4 percent, the most in data going back to 1994, says Pareto Securities AS. More cargoes will diminish the number of idle vessels and daily rates for Long-Range tankers, each hauling 75,000 metric tons, will rise 29 percent to $18,000 in 2014, the average of four analyst estimates compiled by Bloomberg shows. The expansion means more exports to Europe, Japan and Australia, voyages that can stretch to 8,400 miles, tie up ships for longer and reduce available capacity in the fleet of 1,324 vessels. Refineries in India and the U.S. are also adding cargoes. The rate forecasts would make the carriers profitable for the first time since 2008 after a glut of ships caused a slump of as much as 93 percent. The Middle East will process an extra 1.3 million barrels of crude daily in the next four years, a 17 percent advance that is equal to about two cargoes a day, according to data from the International Energy Agency, the Paris-based adviser to 28 oil-consuming nations. Saudi Arabian Oil Co. and Total SA (FP) shipped the first fuel from a new refinery in Jubail, Saudi Arabia, on Sept. 23. The plant will handle 400,000 barrels a day. Middle East nations previously sent more crude to Europe and other regions for refining. Now they are processing more at home and exporting higher-value jet fuel, diesel and heating oil. That’s increasing demand for product tankers at the expense of crude-oil carriers. Rates on the latter vessels are averaging the lowest in at least in 16 years. Tankers carrying refined fuels earned an average of $13,962 a day since the start of January on the industry’s benchmark route to Japan from Saudi Arabia, 22 percent more than a year ago, according to data from Clarkson Plc (CKN), the largest shipbroker. They need about $17,000 to break even, says Carnegie AS, an investment bank in Oslo. Rates peaked at $76,228 in 2008 and dropped as low as $5,387 in 2010. Shares of Monaco-based Scorpio, which has 21 tankers including those being built, rose 37 percent to $9.89 in New York since the year began. The stock will reach $11.89 in 12 months, the average of 12 analyst forecasts shows. The company will report profit of $21 million this year, from a loss of $26.5 million in 2012, according to the mean of six predictions. Frontline 2012, based in Hamilton, Bermuda, will say profit surged to $74.1 million, from $1.4 million, the mean of five estimates shows. Shares of the company rose 47 percent to 41.20 kroner ($6.85) in Oslo since Jan. 2 and will reach a record 62.45 kroner in 12 months, according to the average of six forecasts. Frontline 2012 also has ships hauling coal, iron ore and liquefied petroleum gases. The two companies have the most orders for new tankers, Clarkson data show. The vessels are the kind most commonly used for longer-distance deliveries from the Persian Gulf, according to Eirik Haavaldsen, an analyst at Pareto in Oslo. The prospect of profitable rates is prompting owners to order new ships, threatening another glut upon delivery in about 18 months. The order book for LR tankers increased to 20 percent of the existing fleet from 15 percent in December, according to IHS Maritime, a research company in Coulsdon, England. Rates are still below breakeven and have been on an annual basis since 2008, when the global economy endured its worst recession since just after World War II. Supply of product tankers expanded 34 percent in the past five years as trade gained 17 percent, Clarkson data show. The economy in Europe, the biggest source of demand for fuel tankers, probably stagnated in the three months through Sept. 30 after contracting in the five preceding quarters, according to the average of economist estimates compiled by Bloomberg. The data are compiled from forecasts across the region, including the 17-nation euro area. The continent accounts for at least 24 percent of seaborne imports, according to Clarkson. Europe’s refining industry will contract more quickly than demand for at least the next five years, according to the IEA. About 15 refineries processing 1.7 million barrels a day shut from 2008 to 2012, leaving capacity of 15.1 million barrels. As a consequence, the region is buying more from the U.S., the Middle East and India, the IEA said in June. More cargoes from the Middle East boost tanker demand because they mean longer voyages. An average shipment to France from Saudi Arabia is about 6,200 miles. Moving fuels from Latvia to France, a benchmark route for European rates, is 1,300 miles. Cargoes to Japan from the Persian Gulf travel 6,600 miles. Shipments to Australia are 8,400 miles. Japanese refining capacity will decline to 4 million barrels a day by 2018, from 4.6 million barrels a day in 2012, the IEA estimates. Shipments of refined fuels are also expanding outside the Middle East, led by cargoes to Latin America from the U.S. Gulf of Mexico. Trade on that route will rise 25 percent to 2 million barrels a day this year, according to Clarkson. America’s refineries have more oil to process in part because of fracking, which taps reserves in shale-rock formations. The nation’s crude output averaged 7.2 million barrels a day since the start of January, the highest level since 1991. Exports of refined fuels from India rose 5.7 percent to 5.15 million tons a month in the first half, according to data from the International Trade Centre, an agency of the United Nations and the World Trade Organization. The country’s Jamnagar refinery complex is the world’s largest, handling 1.2 million barrels a day. Freight rates across the maritime industry measured by the ClarkSea Index averaged $9,259 a day this year, set for the lowest annual average since at least 1990, Clarkson data show. About 90 percent of world trade is hauled by sea, according to the Round Table of International Shipping Associations. While refined-product shipments are expanding, the amount of crude carried at sea is stagnating. Seaborne trade in unrefined oil will be little changed at 38 million barrels a day this year, Clarkson data show. The largest crude tankers earned $7,288 daily in the past nine months, headed for the lowest annual average since at least 1997. 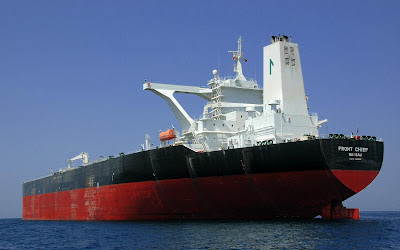 Saudi Arabia, Iran, Qatar, the United Arab Emirates and Iraq, the Middle East members of the Organization of Petroleum Exporting Countries, shipped an average of 478.2 million barrels a month in the first half, 7.4 percent less than in 2012, according to data compiled by Bloomberg.